We have been offering our summer camp for more than 40 years. Because our indoor facility is so large, no activities (including sports or swimming) are affected by the weather. We have five different programs to choose from and offer daily and weekly attendance, as well as early and late stay. Lunch is available. For ages 5 to 9 is similar to our highly successful year-round Kids Club program, and includes arts and crafts, sports, swimming with instruction, trips (i.e. : movies, skating and more), Friday pizza parties and more. It is a fun and activity-filled camp tailored to this age group. For ages 9 and older includes tennis, swimming, soccer, basketball, trips and more. Instruction in all of these activities is included. Our philosophy is to make activities fun. We nurture enthusiasm and sportsmanship. For ages 13 and older. Their own special camp program, more trips and teen-based activities will be included. For ages 8 and older is an intensive tennis program that works on all areas of the game. We provide lots of drills, match play and strategy sessions. We maintain a 4 or 5 camper to instructor ratio to insure maximum attention. Additional optional activities include swimming, basketball, soccer, trips and more. For ages 5 and older specializes in all aspects of Dance, Creative Arts, Musical Theatre and Set Design. Swimming and traditional camp activities can be provided as well if specified. For more details about our camp, including rates for the upcoming session, click on the Summer Camp Brochure link below. 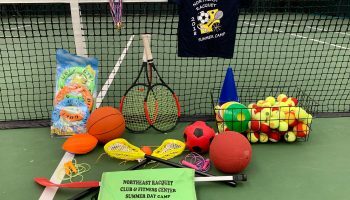 To reserve a place, print out the Summer Camp Brochure (see link below), and mail or drop off with a check for $100 to Northeast Racquet Club at 9389 Krewstown Road, Philadelphia, PA 19115.